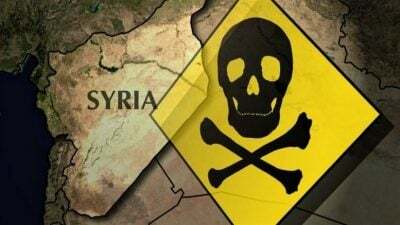 Al-Qaeda affiliated Al-Nusra terrorists have the resources and ability to produce chlorine gas to use against the population, UN special envoy to Syria Staffan de Mistura told a news conference on Tuesday. “I have said and confirm my view that both the government and the [al-Nusra] Front – which is an organization declared as terrorist by the Security Council – have the ability to produce chlorine for armed use,” Staffan de Mistura told reporters. The Russian Defense Ministry has recently warned that the leader of the terrorist group Tahrir al-Sham, which is affiliated with the al-Nusra Front, is planning a chemical attack on civilians in Syria’s Idlib province, in order to provoke retaliation against Damascus. Last week, Russian Defense Ministry spokesman Igor Konashenkov said that terrorists carried eight cans of chlorine gas to a village southwest of Idlib. According to Konashenkov, a chemical attack would create a pretext for Western intervention in the case of an Idlib operation. The Syrian government has already accused terrorists of using chemical weapons on other occasions. On the other hand, Damascus eliminated all its chemical arsenals in 2013 and no longer resorted to chemical weapons. The question of chemical weapons is once again being raised as the Syrian Army makes final preparations to launch an operation to clear jihadist-held Idlib province of terrorist organizations. All the elite units of the Syrian Army, including the Tiger Forces, the 4th Mechanized Units and the Republican Guards will participate in this operation. The defeat of terrorism in Idlib will mean that only small pockets of ISIS in eastern Syria and Kurdish-held regions in eastern and northern Syria will need to be dealt with so that Syria once again becomes a united and sovereign state.